There have been 131 confirmed human infections with avian influenza H7N9 virus in China, but so far there is little evidence for human to human transmission. Three out of four patients report exposure to animals, ‘mostly chickens‘, suggesting that most of the infections are zoonoses. Whether or not the virus will evolve to transmit among humans is anyone’s guess. Meanwhile it has been found that one of the H7N9 virus isolates from Shanghai can transmit by aerosol among ferrets, albeit inefficiently. Ferrets were inoculated intranasally with influenza A/Shanghai/02/2013 virus or A/California/07/2009, the 2009 pandemic H1N1 virus. 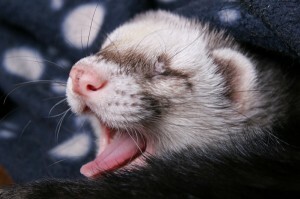 One to two days later the ferrets developed fever, sneezing, coughing, and nasal discharge; both viruses induced similar clinical signs. Virus was shed in nasal secretions for 7 days. Six infected ferrets were then divided among three separate cages, and each group was housed with a naive ferret, and a second uninfected animal was placed in an adjacent cage. Airflow was controlled so that air flowed from the cage of infected animals towards the cage of naive animals. Transmission of infection was measured by observing clinical signs, and measuring virus shedding in nasal secretions and hemagglutination-inhibition antibodies in serum. Of the three ferrets housed in the same cage with H7N9 virius-infected animals, all three had signs of infection (sneeze, cough, nasal discharge), shed virus in nasal secretions, and developed anti-HA antibodies. All three ferrets in neighboring cages developed signs of infection, but only one shed virus in nasal secretions, and two of three seroconverted. From these data the authors conclude that H7N9 virus is ‘efficiently transmitted between ferrets by direct contact, but less efficiently by airborne exposure’. In contrast, transmission of H1N1 virus to naive ferrets by contact or aerosol was efficient (3/3 animals in both cases). The authors also found that pigs could be infected intranasally with A/Shanghai/02/2013 virus: the animals shed virus in nasal secretions and developed clinical symptoms. However the infected pigs transmitted infection inefficiently to other pigs by contact or aerosol, or to ferrets by aerosol. The authors’ equivocal conclusion that “Under appropriate conditions human to human transmission of the H7N9 virus may be possible” could have been reached even before these experiments were done. Their results provide no information on whether the virus can undergo human to human transmission because animal models are not definitive predictors of what might occur in humans. I disagree with the authors’ statement on page 5, “Efficient transmission of influenza viruses in ferrets is considered as a predictor of human to human transmissibility’. While many influenza virus strains that transmit among humans by aerosol also do so in ferrets, this does not mean that human transmission of a novel virus can be predicted by animal experiments. Infection of ferrets with A/Shanghai/02/2013 or or A/California/07/2009 virus results in mild disease with no mortality. In contrast, 32 humans infected with H7N9 virus have died, and many humans have died after H1N1 infection. These findings further emphasize the differences in influenza virus pathogenesis in ferrets and humans. Animals were housed at 55-60% relative humidity. Evidence suggests that inactivation of aerosolized influenza virus is maximal at this RH. I wonder if the results might have been different at RH < 50%, at which virus viability in droplets and aerosols is orders of magnitude higher. this seems to be a definition problem. of subjective probability, an (almost) certain outcome. I wish there could be a cure for this mutating virus in the near future. I really admire the scientists for exploring every angle on how to understand everything about this virus. It’s just scary if it will evolve into a more deadly virus which can be transmitted like a common flu. dear Vincent i wonder to know how to set the infective dose ,in this paper it says “Influenza free ferrets (n = 6) were inoculated in-tranasally with 10^6TCID50″how about 10^7TCID50 how does it influence the result?